Georgian shootings were a Saakashvili, Kaczynski set up? Evidence mounts that the visit of presidents of Poland and Georgia to a disputed area on the South Ossetia border on Sunday, was designed to increase the tension in the region. Georgians, not Russians were behind the now infamous shooting incident. In fact, the Saakashvili presidency has been accused, even by one of its own members, of planning attacks on sepratist regions in August this year. This crisis was not the immediate cause of a “Russian” invasion anywhere, let alone South Ossetia: it was the result of a petulant Sakkashvili, easily provoked by Moscow. 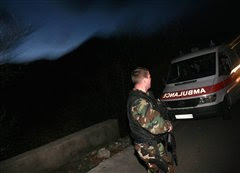 The shooting incident on Sunday, when president of Georgia and Poland, went to the de facto border between Georgia and South Ossetia - and an area that was once in Tbilisi’s hands before the August war - appears, according to the Polish security service, BOR, to have been a set up by Presidents Saakashvili and his Polish friend. A report for the government says that Polish security forces became separated from the presidents’ car. When the first of three bursts of automatic fire began, Georgian commanders at the scene did not flinch, did not react. It was almost as if they were expecting the gunfire. Saakashvili was reported by BOR to have been smiling! The accusation by even Polish officials that this was a set up by the Georgian side - and not the Russians as Kaczynski and Saakashvili have both alleged - does two things. It hands over to the Kremlin a propaganda victory - people will begin to believe Putin much more than they will a Kaczynski or a Saakashvili, or a Bush; it also gives the excuse to Moscow to ratchet up the bullyboy tactics in the Caucuses, and weakens any principled stand against them. Many are coming to the conclusion that Poland’s president’s obsession with the region is helping make the place more unstable. If rule one of foreign policy is: ’Do no harm’, then Kaczynski is failing the test. We should not join President Kaczynski or anyone else - like George W. Bush - in trying to make out that Saakashvili is some kind of super-patriot, fighting a lone battle against the evil empire of Russia. The reality is that both politicians - from Georgia and Poland - are more interested in a “crusade” against the Kremlin, for reasons best known to themselves. The rest of us should not be joining in on this vanity project. Kaczynski, Saakashvili at the end of Russian guns? Oh, dear. This story is going to be huge. It is emerging that two different issues are at stake: firstly, who fired the shots and were the shots actually fired at President Saakashvili and President Kaczynski? And secondly, it has emerged that the security arrangments travelling with Pres. Kaczynski were woefully inadequate for a trip to what is, basically, still a war zone. The convoy travelling with the two presidents was between 15 and 30 cars. Journalists, unusually, were placed near the front of the motorcade. Suspicious? The trip - to an area in South Ossetia, which was, unusually, was in control of Georgia before the short war in August but is now in Russian controlled hands - appears to have not been on President Kaczynski’s original itinerary: he was in Georgia to celebrate the fifth anniversary of the so-called Rose Revolution. But, sometime on the way to Georgia, or when he was actually there, he and Saakashvili decided to go and see if Russian troops had in fact withdrawn, as was in the plan the EU cooked up at the end of the shooting. Well, Kaczynski found - you could say, Kaczynski has demonstrated - that Russia is still in control there. Russia says the whole thing was cooked up by Saakashvili and Kaczynski to make Moscow look bad. Kaczynski and Saakashvili say that the whole thing was a provocation by Russia. At a guess, the shots probably were by South Ossetian militia - but to what aim? They say that the convoy asked for permission to enter the area but this was refused. Some of the cars, regardless, started to enter. Maybe that was when the shots - warning shots - were fired? That said, reports by journalists travelling with the two presidents say that at times security officials were nowhere near the car taking Kaczynski to a zone with a lot of guns in it. 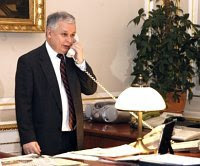 Whatever Kaczynski was up to he was being extremely reckless, as he was when he showed up with presidents of the Baltic states and Ukraine on the final day of the August conflict. The Polish government has been trying to clam things down saying that the whole incident was not as serious as is being painted by the Presidential Palace and they have inferred that this is a very convenient way for president Kaczynski to scupper any re-start of talks between the EU and Russia to forge a wide ranging agreement on many issues - something that the Civic Platform led government supports. Whatever - Kaczynski’s one man war with the Ruskis continues. “In the last 17 years, this country has been invaded by murderers, thieves, prostitutes…and spies,” says David, dramatically, a Georgian migrant to Israel, who works as a security guard at the Yad Vashem institute in Jerusalem. 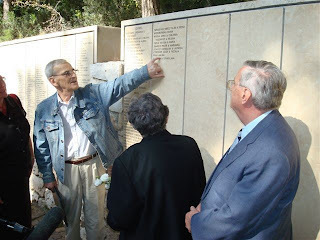 We had only met the guy two minutes before, after stopping to ask the way out of the vast and beautiful complex of Yad Vashem, set up as a permanent reminder of the Shoah, or Holocaust, situated on the edge of a forest on the outskirts of the Israeli capital. But already - true to his Georgian roots - David has offered us something to eat - a tray of meatballs, mashed potato and pasta - and is now pouring us a huge glass of vodka. Lovely guy! David, the security guard - so he must have been bored out of his skull (cap) - says he came to Israel in the mid-1970s, after working for the KGB in some aircraft surveillance capacity. He was on duty for the Soviets in Prague in 1968 and was ordered to shoot people - something he says was “terrifying”. “If you don’t shoot then they [the Soviets] shoot you,” he said, as the vodka liberated his tongue. Eventually he had had enough of working for the Russians and left for Israel. Now, as he pours the second, huge glass of vodka for me, he says how Israel has changed for the worst, mainly due to some of the recent immigrants, he claims. We were at Yad Vashem to see the latest name to be added to the list of over 22,000 people from 41 countries, honoured as the Righteous Among Nations, those who helped Jews, often risking their own lives to do so, during Nazi occupation. The last name, which was added to the list on November 11 this year, was of Catholic Pole, Stanislawa Slawinska, who sheltered ten Jews in her home, while a Nazi officer lived next door. The list - laid out by country - resides, elegantly, in a garden about five minutes walk from the main museum building. So after passing through the museum - a harrowing experience, but one of the most extraordinary exhibitions I have ever seen, telling the whole gruesome story of Nazi horror - we set off to look for the garden, the lists and the name of Stanislawa. You can imagine the disappointment, then, when I discovered that though her name had been put at the end of the long list of names of the Righteous from Poland - far bigger than any other nation - it had been mysteriously rubbed off - as you can see by the photo below. But David is right about how Israel has changed, certainly since my days working on the Megiddo Kibbutz, quite near Nazareth in the north, in the late 1980s. Another, more important, change, is the growth of religiosity in Israel. It was very noticeable to me how many more of the ultra-orthodox there are, but also how the Muslim community has become more religious, too. I was given two explanations for this. We were sharing a taxi with a Jewish guy from Cockfosters in London, a place only known, as he said, for its position at the opposite end of the Piccadilly line from Heathrow airport. He was on a business trip for the chief rabbi in London - something to do with education programmes. I was asking him when and where his family came to London from? He said he didn’t know for sure, but it was probably somewhere in Poland, certainly before the 1860s. He then pointed out that the ulra-religious in Israel has many more children than the more secular Israeli - up to eight children a family, on average! - so the growth of religiosity is a simple numbers game. Though from London, he referred to coming to Israel as like “coming home.” But after we dropped him off at his hotel, our driver - who had been quiet throughout our ten minute conversation - immediately became very animated. Our driver was a Palestinian who lived in the Old Town in Jerusalem. And whose home Israel is, of course, is at the root of all the problems there. I asked him why I could see more signs of religion among the Palestinian population. “It‘s simple - we don’t like seeing the western way of life.” I asked him, however, if he didn’t think that the problem was more about politics than religion - the old pan-Arab, secular nationalism has failed, leaving the door open for more religious groups like Hamas to take over. “No, I hate politics,” he said, and then proceeded to give me a lecture about Palestinian politics. Whether the growth of religion in Israel is a numbers game, or childbearing patterns, or because of western decadence is open for debate. 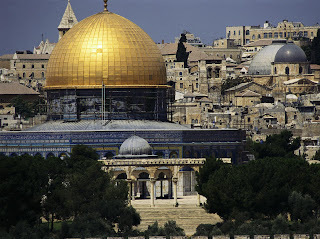 But I still maintain that it is actually the failure of the old leftwing-rightwing politics in Israel and elsewhere that is leaving the way open for ultra-conservatives, both Israeli and Palestinian - and that means the end of this long conflict is getting further away, not nearer. * Yad Vashem mystery solved. It appears that the name of Stanislawa Slawinska was rubbed off the wall in the photo because somebody put her name on the wrong wall by mistake! So it was rubbed and the name was engraved, later, at the proper place. The photo below shows the unveling ceremony, November 11. Have been asked by journalist David Dastych to publish this letter from mother of murdered Sgt. 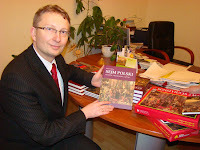 Jan Pietrzak to president-elect Barack Obama. They killed my son. He was 24 years old. He was a US Marine Sergeant. His name was Jan Pawel Pietrzak. Jan Pawel is John Paul in English. He was named after the Polish Pope John Paul II, who made this world different and changed the course of history bringing about the fall of communism. After 9/11 my son at 17 decided to join the Marines. He wanted to defend America. He wanted to join the legendary corps known for Honor, Courage and Commitment, to protect the American President and most important people. He chose a tough but noble path of the Corps of the Few and the Proud. He Joined the Marine Corps in 2003, fought in Iraq. After his tour of duty, he was assigned to Camp Pendleton, CA. He was promoted to the rank of Sergeant in a helicopter unit, commanding a technical support team. In May, he bought a house in Winchester and on August 8 married Quiana Jenkins, his Afro-American bride from California. They were just beginning to build their life together. That life was taken from them on October 15 in a savage murder. They were attacked in their own home. They were bound, gagged, and tortured. My son's wife was brutally raped, probably before his eyes. Subsequently, they were executed in cold blood. The murderers were four soldiers, US Marines, like my son, his brothers in arms. From the same unit as my son, two under his command. They were four Afro-Americans, like my daughter-in-law, her brothers of the same ethnic extraction, brothers who murdered their sister. I ask: Why did it happen? Wherefrom such hate, such savagery, such indifference? Why were my son and my daughter-in-law so unacceptable to them? What was the underlying motive? Was it just a desire to burglarize the house? If this was really the case then why did they not come when my son was away? Why did they come in the middle of the night armed to their teeth? I ask: How could such an unthinkable act happen? How could such individuals, predisposed to murder, one of them was a former gang member press accounts induction have been lowered recently for need of manpower in a time of war? If individuals with a record couldn¹t be inducted, my son and his bride would be alive today. Death in a war is a patriotic honor for a soldier. This fact enables the family to overcome the tragic loss of a loved one. A murder of a soldier by a soldier in his own country makes military service senseless. Such a death becomes eternal sorrow for the family. My loss will not cease until my death. I wish no mother of a soldier go through such torment as I have. This is why I ask that my son¹s death be fully and honestly explained. This must be done for all the mothers of soldiers who serve their country. The parents of my daughter-in-law deserve the truth too. They need to know why she died, a wife of a soldier. They need to know why she was selected to be so savagely attacked as if she were an enemy in her own country in time of peace. This must be fully explained for the sake of all the families of military wives. The murder of Quiana and Jan Pawel is an unpardonable evil. Their brothers murdered them. It is time for no one in America to die this way again. I am asking you, Mr. President, to help me believe in the possibility of that Change. Yes, it’s true. Obama didn’t just win an election last Tuesday, he has become the “Black Messiah” of the new left, is a joy to Islamist weird beards with life-style ambitions to become a suicide bomber, is a “pacifist”, and is the black man whose presidency will bring White Man’s civilisation crumbing down around Barack’s rather large ears. I made the bit up about his ears (though they are HUGE! Put a couple of solar panels on them and you could produce the energy needs of the White House). But the rest of the bull above actually did come dribbling out of the mouth of one of Poland’s most loony of politicians, Law and Justice MP Artur Gorski (that's him in the photo). The remarks - which many believe to be a little…you know…racist…were made to parliament last Wednesday. Slowly the horror of what he said burned…foreign ministry condemned him…his own party promises he is going to get a good spanking. Journalists have printed the whole transcript of what he said and, no, he wasn’t taken out of context. Gorski has been in the news before, during a campaign to get an image of the Virgin Mary put on the national flag. He was also one of a bunch of MPs who wanted to make Jesus the King of Poland. What makes a frazzled mind such as Gorski’s put together devout Catholicism, a nutty type of nationalism, the most blatant racism, and his own delusional fantasies that he - he! - is superior, in anyway, to anyone, ever? This is the last post about Obama for a while. Promise. In fact, the next beatroot post will come to you, direct, from Israel. Even though not as enthusiastic as most Europeans, Poles would vote for Barrack Obama by a margin of three-to-one. By more than a six-to-one margin, a majority in the United Kingdom would prefer to see Barack Obama elected president instead of John McCain. Britons are among the largest majorities saying that America’s relations with the rest of the world would remain the same under John McCain, while a majority says they would improve under Obama. Support for Obama is pretty unambiguous in Britain. In Poland, though not so clear cut, support for John McCain is weak. Thirty-eight per cent of Poles would like to see Barack Obama elected US president while just 13 per cent say they prefer John McCain and 49 per cent do not express an opinion. Poles are divided on whether America’s relations with the world would improve if Obama were elected US president (33%) or whether they would largely stay the same (31%), though just 4 per cent feel they would become worse. Poles most commonly would see relations staying the same under a McCain presidency (41%), while 12 per cent say relations would improve and 6 per cent feel they would become worse. Just 13 percent would vote for the Republican! This is quite a change from four years ago. Back then, the Philippines, Nigeria and Poland were among the few countries to favour Bush's re-election. All three now favour Barrack Obama. In the US itself, the Polonia vote is mixed. Rob Strybel, who is an American Pole based now in Warsaw, sums up the changing voting patterns of Poles through the decades. Like most immigrations they voted Democrat through the New Deal years. Polonia’s pro-Republican stance became more firmly grounded during the presidencies of Ronald Reagan and George Bush, Sr, both of whom were seen as aiding the cause of Poland’s independence. But now it is 2008, and Blacks, Jews, Latinos, trade-unionists and most Hollywood types have by and large remained Democratic sympathizers. With Polish Americans and voters with other East, Central and Southern European roots, political loyalties are more diversified. Some say that most Polish Americans have made the transition into the middle class and do not perceive themselves as a separate electorate with specific needs. So Poles do not vote a block anymore and have differsyfied in terms of class, areas where they live and so on. They have, in short, become more American. The central issue, I think, for everyone watching the election, both in the US and outside, is: which candidate can get back the respect, at home and abroad, for the “Land of the Free”? I think that a vote for Obama just might get back some of that respect. But you never know - after four years the world might be ready for Mrs Palin. God save us. God bless America: the only country in the world which has the bright idea of representing its two main parties by the sign of an elephant...and a donkey?